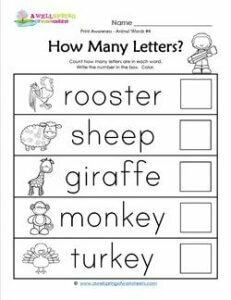 A print awareness worksheet where kids get to count how many letters are put together to make these five animal words – rooster, sheep, giraffe, monkey, and turkey. The type, though still large, is smaller than worksheets #1 and #2. After counting your kids can color the pictures. Go to this page for more print awareness how many letters resources and worksheets like this one.